I am not a lawyer…you are…so you as a lawyer know the value of a client. It is not just a one-time thing. Once you have captured a client for your law firm and gained that client’s trust, you will have them (and their referrals) for life. However, you are battling not just your competition when acquiring these clients. You are battling review sites (Yelp and its ilk), online advertising, as well as google’s algorithm. 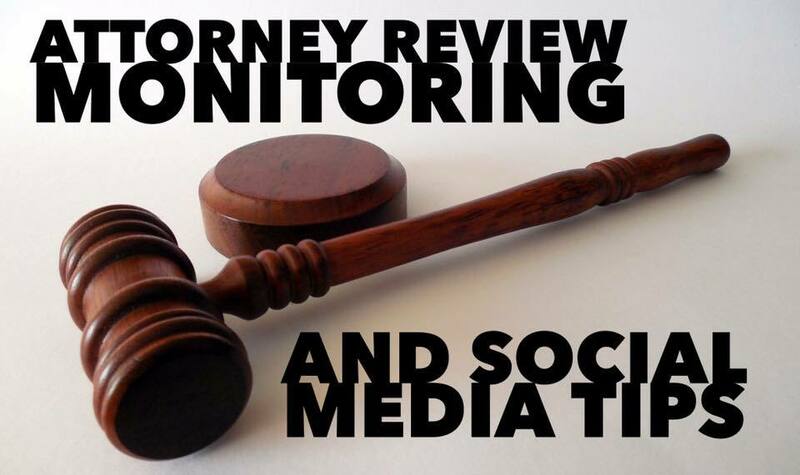 This is where review monitoring and social media come in. If you’ve got a handle on these two, you can significantly increase your chances of having potential customers look at you instead of the other guy/gal. There are tons of review websites on the internet targeted at attorneys. People are are more than happy to share their “honest” opinions about products and services they use, including you. Because of this, online sites such as social media, forums, and even blogs can either make or break an attorney’s reputation. While you are working hard to build your practice, one or two bad reviews from an unhappy client (or a sneaky competitor) can cause a serious dent in your finances. This is why it is imperative for you to know what is being said about you not just on review sites, but in social media, blogs, and even large publications. This can be extremely time-consuming. Spending each day entering your law firm’s name…then each of your associates into Google and hoping that the search is accurate. You could do this, or spend thousands of dollars on a reputation monitoring firm to find your money quickly dwindling. Instead of doing that, sign up for Socialdraft. Our dashboard has incredibly accurate reputation monitoring alerts. They are relevant, timely, and shareable to social media. You can’t win them all and chances are there’s going to be one or two bad clients who are more than willing to splatter your name all over the Web. You shouldn’t let a couple of bad clients ruin years of hard work and dedication. You want to be confident that the good word is always spreading about your law practice. Socialdraft is a tool that allows attorneys to schedule posts to social media, engage their community and potential clients, and monitor their online reputation. This can help you determine what information is out there about you and your practice so you know in advance what’s being said about you and your services. Socialdraft offers review monitoring from some of the largest sites out there (we monitor billions of websites including social media sites, review sites, blogs, and serious publications) so you can be sure you are getting real-time updates from the sites that matter most. Socialdraft allows you to view what’s being said; the good, the bad and the ugly! This way you can brag about the good, take action on the bad, and take action on the ugly. Your Law firm needs an extensive research tool to help market your company, and Socialdraft knows that reviews can be a massive part of an overall marketing strategy. If you’re worried about your attorney reputation monitoring, you may want to consider adding the power of this unique tool to help keep you informed of what’s being said about your practice on a daily basis. Knowledge is power, but this site goes one step further and offers you tips on how to respond to the feedback your practice has received, how you can rank higher on search engines and how to keep your determine what users are saying about you and your services. This is a unique and vital tool that you won’t want to pass up! In order to grow your attorney practice, you’ll need to stay on top of your reviews and work to find potential clients and make plans to improve your business. 1. Use The Right Tools: You don’t have to be on Social Media all the time. Use a tool like Socialdraft. Log on twice a day for 10-15 minutes. Schedule your social media posts, check your alerts, and interact with your community. 2. Keep Attorney Advertising and Solicitation Rules in mind when you create social media posts. You’re an attorney, you know these way better than you, so make sure you follow the laws and regulations of the country and state you practice in. 3. Be consistent. This is not as hard as it seems. You’re already logging in twice a day. Just make sure you keep this habit up and you won’t get lost in the shuffle and noise. 4. Claim your profiles. Do this on all social media. This way you always have control over your brand. 7. Make things beautiful. Make sure your logo is sharp, that your timeline images look gorgeous, and that your headshot makes you look like a complete professional. 9. Check out the competition. See what your competitors are doing. This way you don’t miss a beat. 10. Share useful content. This is above all the best type of content you can put out there. If you solve someone’s small question, you have a better chance of retaining them as a client. 11. Show your friendly side. Lawyers can be seen as scary, sometimes even evil. If you’re affiliated with a local charity, create posts about them and your activities to help them. Those who are interested in said charity, will find this favorable and remember it when they need council. 12. Keep Professional and Personal separate. This means you need to get acquainted with privacy settings on social networks where you speak as yourself. Do not share your personal thoughts on your business social accounts. 13. Do not give legal advice. Yes…we told you to help out by sharing useful information. This is entirely different from giving legal advice…so keep in mind that the rules of your profession extend to social media. 14. Target potential clients. Yeah, go ahead and use that search function. People will discuss their legal issues on social media – maybe they shouldn’t – but they do. So go ahead and do a Twitter search for “car crash”…or “cheating spouse”, or whatever your specialty is…include local when you can so you can make sure your prospects are targeted to your niche and location. If you’re not doing this now, chances are neither is your competition. 15. Join groups. Both LinkedIn and Facebook have groups. Join local groups to increase your social circles. Every person you get to know is a potential client.